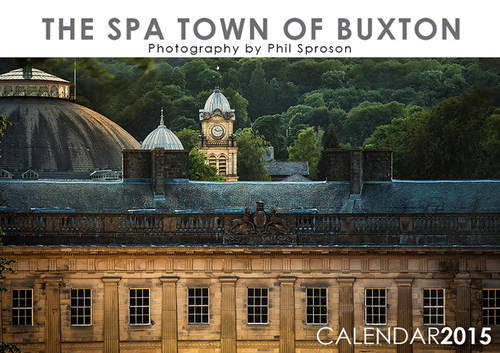 Peak District photographer,Phil Sproson,has produced a calendar of the Spa Town of Buxton for 2015. It encapsulates the architecturally significant town from its centre with some great views of the Crescent, the Devonshire Dome, Opera House, Old Hall Hotel and Pavilion Gardens and then outward to the surrounding countryside within a 10 minute drive. The calendar features locations such as the Cat & Fiddle, the Goyt Valley and Solomons Temple as well as a photograph of Poole's Cavern. It is produced on high quality paper, and can be bought for £7.99 from the Poole's Cavern visitor centre. Trevor Osborne outlines the latest progress on the crescent project. Trevor Osborne addressed a public meeting at the Octagon in the Pavilion Gardens on Wednesday evening to present an update on the Crescent Project and to take questions from members of the public. Explaining that the project had suffered delay, in part because of the understandably complex negotiations with Nestle, to ensure that their rights to extract the water were protected during the restoration and building works. The matter was resolved with the granting of a £12m indemnity to Nestle in the event of any disruption to their supply. Main Contractors have been chosen and now the enabling works have been completed the revised plans have been submitted to the council and a decision is expected on these by November. Mr Osborne also explained that the restoration project had lost a vital part of its funding when Government decided to abolish East Midlands Development Agency, and replace it with Local Economic Partnerships. With the abolition of EMDA went some £5m in support which it has not been possible to replace. On the day of the meeting Mr Osborne hosted a lunch to which English Heritage and a number of key partners in Buxton were invited. 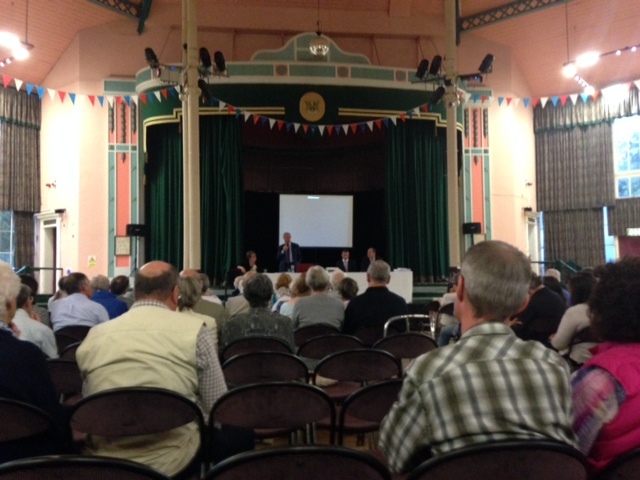 Jonathan Davey a Director of Buxton Civic Association, who attended the meeting, commented that the response from English Heritage seemed positive. “We explained that the Crescent was important not only to Buxton, but was part of the heritage of Britain.” It is understood that English Heritage will consider whether any additional heritage lottery funding with be granted by the end of September. Key to their consideration of financial support is the heritage visitor attraction experience. The strategy for this, first developed in 2006, has been rethought. New consultants have been appointed and the proposal is to have the visitor attraction element managed by a charitable trust which in turn will be supported by a number of local organisations of which Buxton Civic Association will be one. In addition to setting the crescent in its historical context with actors in period costumes and an 18th Century heritage bedroom as the centre piece of the public visitor experience, the story of Buxton water will also be explained. The intention is to create an interactive, historical experience for visitors to the crescent. The Heritage lottery funding is critical to the continuation of the project, and assuming everything goes according to plan the restoration will create a 79 bedroom 5 star hotel, with 6 boutique shops. A roof top swimming pool is also proposed. The Spa will be open to residents of Buxton and guests of Buxton Hotels. It is expected that the project will be completed by 2017. Alyson Philips did a fantastic job in organising a member’s social evening at such short notice after the Chapel en le Frith Civic Society had to cancel our trip to them, last Thursday. As well as the chance to enjoy Alyson’s baking, Members were given a sneak preview of the panoramic photographs from Solomon’s temple that Lyn Noble has been preparing. It is hoped that these will go on sale at the visitor's centre in the near future. There were some interesting discussions about the future of the market amongst other things. A big thank you to all those members who supported the event. We are looking forward to the next one already. In the next month or so Alan Walker and the BCA woodland volunteers will be out and about working on the Woodland Glades, in Grin Low,. giving them their all important annual cut back. 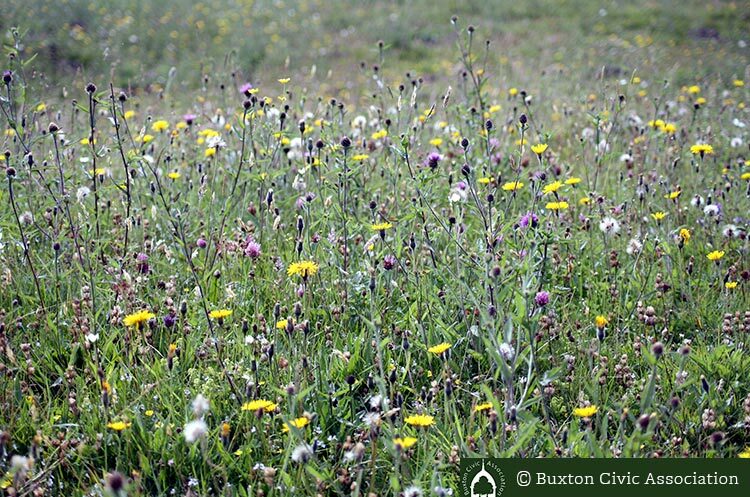 These beautiful wild flower glades, that we have created and work hard to preserve and maintain, are becoming all the more important in the light of the recent news about the loss of much of our remaining wild flower meadows to intensive farming. The woodland glade areas are associated with the 17th & 18th century lime burning industry on the hillside. Below each kiln is a wide area where waste limestone ash was tipped. Slowly the lime tips were colonised by lime loving species of herbaceous plants and grasses such as Northern Marsh Orchid, Burnet Saxifrage, Globe flower, Mountain Everlasting, Creeping willow and Juniper creating a unique habitat which unlike the neighbouring farm land is not grazed or fertilized by animal livestock. The area of Grin Low was designated by the Nature Conservancy Council (now Natural England) as a site of Special Scientific Interest in 1983 recognising the Juniper as the only surviving example in Derbyshire and was re-designated by Natural England in 1981 under the Wildlife and Countryside act. With continuing advice from Natural England it was recognised over 15 years ago that without careful management the glades would be encroached by rank species of grasses and invasive trees species such as Birch and Ash and these valuable areas could be lost. Since then a project which was originally funded by Natural England has seen the glades annually cut using power brush cutters and the cuttings raked and removed from the glade. This is important to prevent the thin soil layer from becoming too enriched and therefore able to support invasive species. This is a highly labour intensive time and the BCA woodland volunteer group are invaluable in assisting with the grass clearing and cutting back saplings on the glade edges. We have now bought back eight or so glades to good condition which total around 7 acres of the 100 acres of Grin Low wood and hope to enlarge some of these areas further. Sadly funding is not currently available for this project which makes the need for volunteer help even more important so if anyone has a few hours to spare anytime in September and October please contact Alan at Poole’s Cavern visitor centre on 01298 26978. 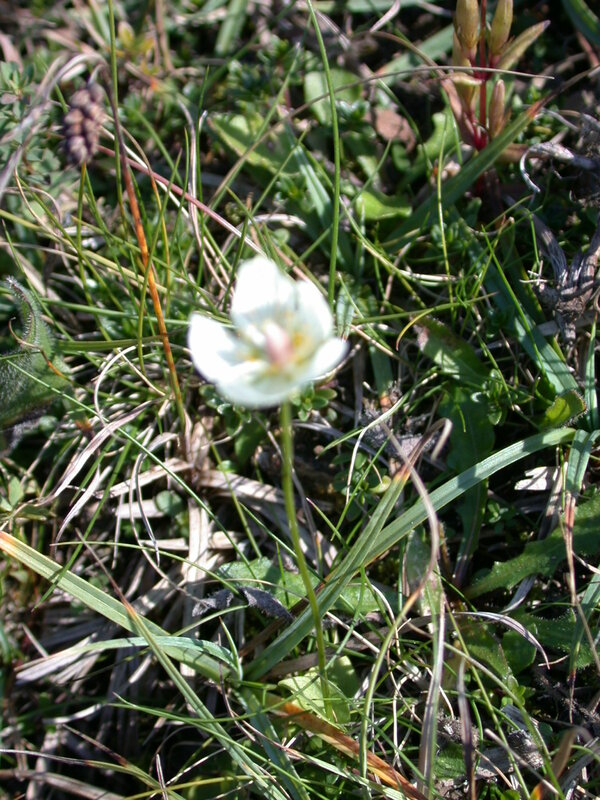 June Noble has produced an excellent guide to the Wild Flowers of Grin Low accompanied by some wonderful photographs by Lyn. 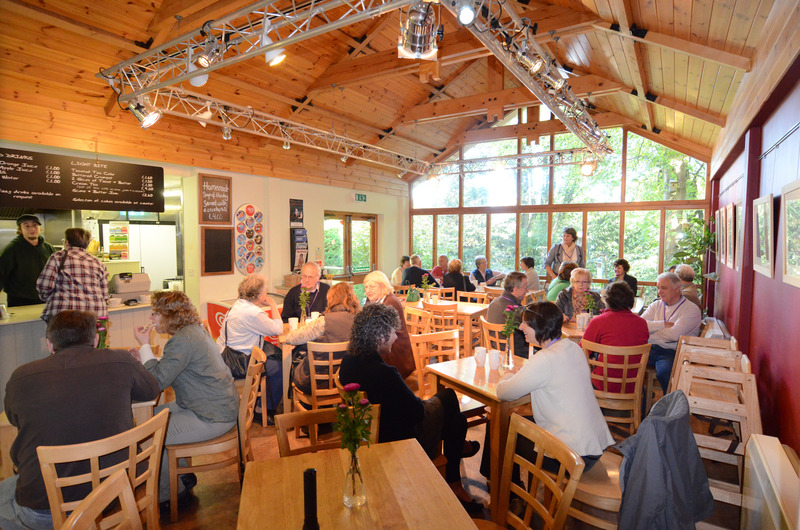 The Guide is available from Poole's Cavern Visitor Centre for £3.00.